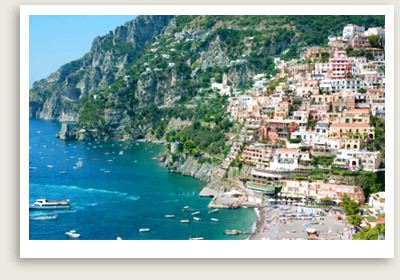 PRIVATE TOUR OF POSITANO IN THE AMALFI COAST FROM NAPLES OR SORRENTO WITH UPSCALE PRIVATE TRANSPORTATION. Shore Excursions from Naples Include: Our private shore excursions from Naples to Positano, Amalfi & Ravello include services of your private tour guide, private transportation to and from the port of Naples, taxes, tolls, and parking. Not included: Entrance fees to any sights you want to visit, meals, beverages and other personal expenses. This privately guided shore excursion from Naples takes you to Amalfi Coast along the elegant streets of Positano, Amalfi and Ravello, three world-famous holiday seaside resorts, rich in history, fashion and spectacular views. Last stop on your private shore trip is a tour of Ravello, which has long been a retreat for artists and writers seeking their muse, from Richard Wagner to Virginia Woolf. You will be blown away by the beautiful Villas Rufolo and Cimbrone, with their gardens towering above the sea from an impressive height.